The ‘Floppy kid syndrome’ in Angora goats can occur when kids are raised under intensive conditions. In cases that I have come across the in Angora goats the kids have been between 2-3 months old that have been fed concentrate feed under drought or intensive conditions. You may recognise the symptoms in the 3 videos below? The syndrome has however been reported in other goat breeds in very young suckling kids in lambing pens or when kids are raised as ‘hansies’..
‘Floppy kid syndrome’ occurring in 2-3 month old kids fed concentrate diet. The kid seems wobbly (ataxia). The kid may stumble and its legs cross over. If you lift a floppy kid off the ground about 30 cm and drop it down it will drop down onto its knees/belly while a healthy kid will remain standing. It is important to note NO tail twitching and NO short choppy hind quarter gait occurs as may be seen in some neurological cases effecting kids of similar age and feeding conditions such as Poloioencephalomalcia (Thiamine Vit B1 defficiency). Blood glucose levels were low normal 4mmol/l in this case. The main PM lesion found in cases are localised to the liver. 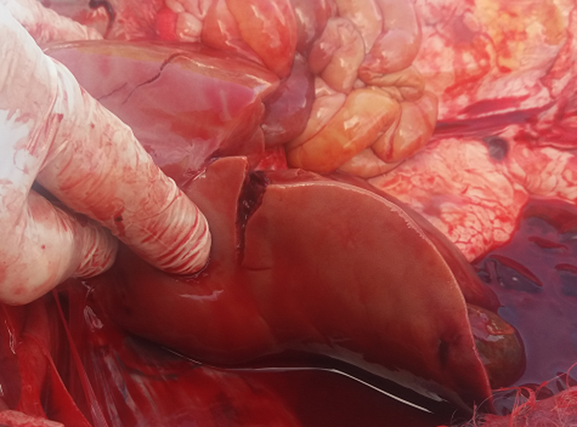 Liver becomes friable and may even rupture resulting in abdominal bleeding. Below is the abdominal cavity of a kid opened to show the haemorrhage occurring from the split in a friable fatty liver. If a vet is unavailable and on farm treatment is carried out where a vet has not diagnosed the syndrome then a blanket approach is taken to cover conditions of similar clinical appearance. Make sure the concentration is high at least 100mg/ml. Every 3 hours for a total of 5 doses. Inject 2ml Vit B Co so as to cover the other Vit B’s. The excess intake of this milk prevents proper digestion resulting in a toxic bacterial overgrowth in the stomach.